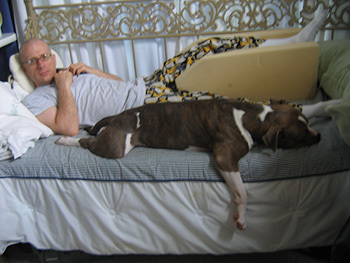 Herman the pit bull came into my life a couple years ago, quite unexpectedly, as angels often do. Yes, that’s right, I said angels. Herman has changed my life and even helped others around him to heal old scars. Just ask my neighbors who have come to know and love him! When Herman and I first met, I was going through a hard time in my life as I dealt with depression and repeated physical injuries. My challenges conspired to keep me on the couch, and I was increasingly isolated from much of the outside world. I found myself spending more time watching TV and less time with people. 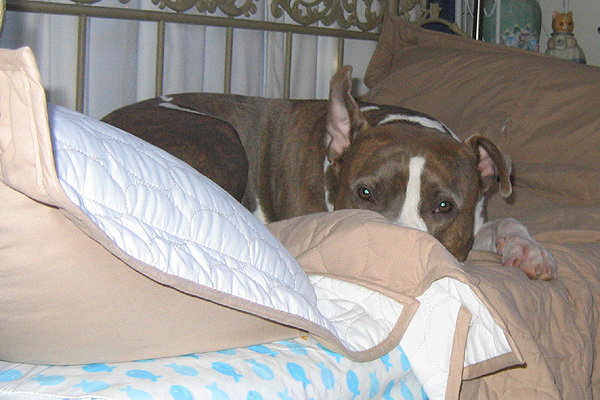 I became drawn to shows about pit bulls and the victimization of this breed. 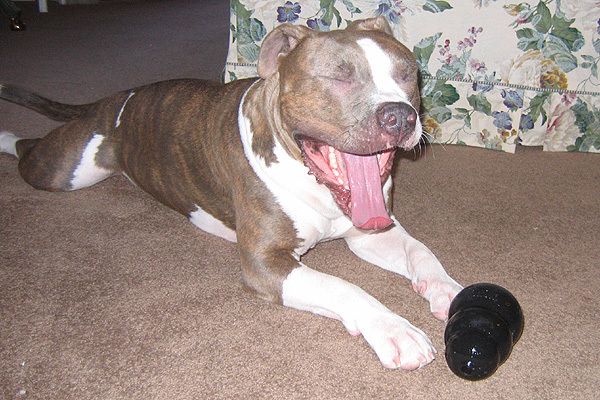 The term pit bull had become synonymous for many people with viciousness. My fascination with these dogs went deeper than pity. I empathized with their plight. Having spent my life struggling to cope with bi-polar disorder as well as attention deficit disorder in addition to neurological challenges, I know first-hand the damaging effects of labels. 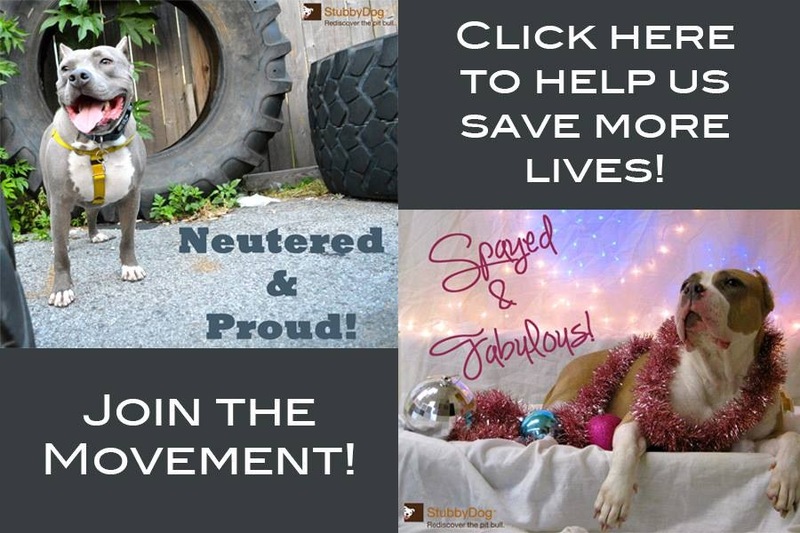 When a friend took in a pit bull named Hammer for some friends of her daughter, who sadly could no longer keep him due to some life changes, I jumped in and offered to help. Since that day more than one life has since been touched by this floppy-eared blessing. My friend and I took turns fostering the animal, until it was decided that it was better that I took in the dog myself. Nearly 10 years had passed since I had suffered the loss of my previous two dogs, Molly, a white German Shepherd, and Booker, an Anatolian Shepherd, and shortly after that I purchased a town home with my incurably ill mother. She deals with her own physical challenges that are brought on by her illness. I made some attempts to find Hammer a good home, all of which failed. By this time there was a real and growing bond between the dog and my mom and me. We decided that he was meant to be with us. The formal adoption took place soon after, and we renamed our precious little guy Herman, after Herman Munster, the lovable yet misunderstood character from the classic 1960s TV show “The Munsters.” He now had a new home and a new name, but he still had an old problem: a label. 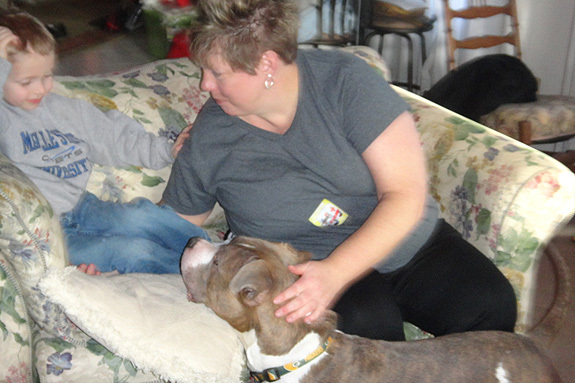 Herman is a happy-go-lucky dog who loves people and is great with children. He can be a bit hyper and is sometimes mischievous, but always loving and affectionate. He soon settled in and made himself at home, spending much of his time engaged in his two favorite activities: playing with his Kong and snuggling. One day when I was out with Herman, Mike, one of my neighbors, came over with his 3-year-old son to ask if they could meet Herman. I was thrilled that people around me were taking interest in Herman and happily agreed. The neighbor with whom Herman and I were interacting was a friend of mine who had grown up around dogs and loved being around them. His wife, Shar, on the hand, was a different story. She was terrified of dogs. As a child, she had been the victim of a dog attack that had done serious harm, both physical and emotional. Shar is among the most intelligent and highly motivated people I know, so a lack of knowledge about dogs was not an issue. In fact, I dealt with that fear for some years myself after being attacked as a child by a neighbor’s dog. Some months later, while Herman and I chatted outside with Mike, Shar, much to my surprise, came over to meet Herman for herself. I was shocked and excited at the same time. Shar told me that she felt somehow compelled to come and meet Herman for herself. We all talked for a while before going our separate ways. Days later, I heard my doorbell ring. Herman was barking so I went to keep him from running to meet our guest. I opened the door to find my friend and neighbor Shar standing there. As soon as I invited her in, she asked to see Herman. Stunned, I called Herman over. Shar then proceeded to look Herman in the face, saying that she knew he could understand her and thanked him for helping her to overcome the lifelong phobia that she had struggled with for so long. This is where it gets even more amazing. She informed me that she had gone to the humane society recently, on her own, to explore adopting a dog for her family. Wow! What a moment. Circumstances have forestalled Shar’s plan to adopt a dog, for now anyway. The happy story though, is no less amazing. She’s been known to bring her son, now 5, over to play with Herman. She interacts with this pit bull as though it were her own family pet. Angels don’t have to have wings and halos. Sometimes they come with a happily wagging tail and two floppy ears. How’s that for a happy ending? What an amazing story!! Herman is a great name for my Grandfather and favorite Uncle are named Herman respectively. @theprettychic Thank you. “Herman” seemed to somehow fit him. That is a most amazing story, so much so, it brought tears to my eyes. Herman is a true Angel and a great ambassador to our breed. (((((HUGs)))) and kisses to Herman! @KerriBaker we know, isn’t Herman such a good boy. He knows exactly what is needed and fills that need. Gave Herman those hugs and kisses. He can never get too many of those!